I’ve always been bad about letting papers pile and pile and pile. And pile. And pile. I’d say I’m letting you in on a secret, but it’s not really a secret. If you know me, you’ve probably seen my piles. Lurking. Stretching. Towering. Do you remember that poem about Sarah Cynthia Sylvia Stout? Well, had I been Silverstein’s muse, that piece would have been about paper. Finally, a year or two ago, two major things helped me kick the habit: Creating a tight system, and changing the habits that kept me in piling slavery. This isn’t to say I’m not still tempted to pile, or that I never get behind. But whereas I used to never see the end of my papers, these days I regularly do. For me, that’s some serious progress. These days, real mail is more special than ever. But a Facebook birthday wish or Twitter shout-out is so fast, most of us have stopped stamping envelopes altogether. And yet with personal mail (from the postman) nearing extinction, sending greetings that can be seen and felt really lets people know they matter to you. A Letter Bin is a single container that houses everything you need to write a letter and get it in the mail. When you think of someone you’d like to send a hand-written note, just pull out the container, and everything is at the ready. Easy to get started. Easy to finish. Just, easy. Unless you write a lot of letters, I suggest using a bin instead of a drawer. That way, when you’re not using it, you can more easily put it out of the way. I love clear plastic shoeboxes like this one, because they stack well and it’s easy to see what’s inside. Use whatever you find functional and lovely. Oh – and make sure the lid closes easily. Otherwise it’ll get annoying pretty fast. Collect your snail mail accoutrements. If you want to include your children in the process, put paper and markers and stickers and what-have-you in there for them as well. Or help them make their own bins! If they love to receive mail, encourage them to write (or draw) and see who replies back. 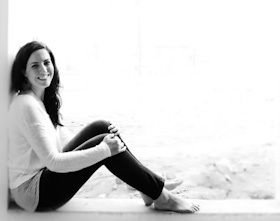 It’s a personal and practical way to practice writing. Now, this final part is going to blow your mind, but stick with me. Put all the stuff you collected into your container. Next time you want to tell a friend you care, just grab your bin and your address book and get started. You’ll be done in a flash. Best of all, the cleanup is stupid easy. Throw everything back in your bin and close it up. Ta-done. Do you write as many notes as you’d like? What seems to keep you from it? I seem to always have random things I want to share, so this is me finding a way to share some high geekery with you. And yes, you can make fun of me. More often than I’d like to admit, we end up playing duck-duck-goose with our DVDs at the exact moment when we really want to let the brain-dead-ing begin. I recently decided enough was enough and came up with a way to avoid it. You know, I’m all about sophistication around here. Before you start the series, turn the discs where all the titles are right-side up. 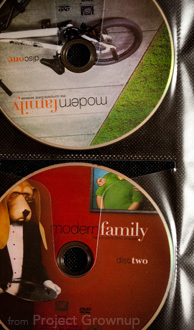 When you watch the final episode on a disc and you’re putting that disc back, put the finished disc in with the title upside-down. Next time you go to watch an episode, the first disc that is right-side-up is the one you want. Now, I can’t help but ask… are the Dude and I the only ones still watching TV on discs? We kind of have to because our internet is so fickle, but I tend to like DVDs anyway because they’re often cheaper than their digital siblings. But nearly everyone I talk to these days only streams. Well, that or DVR. Man I miss DVR. 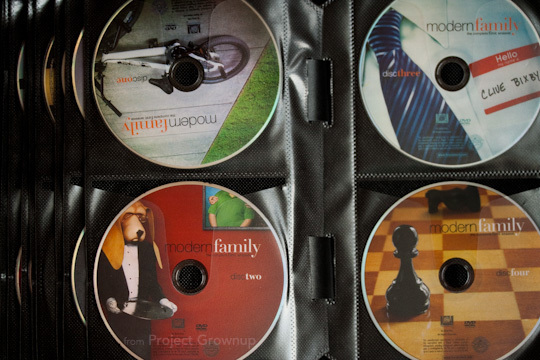 Do you still watch TV on DVD (or Blu-ray)? Is there something out there besides streaming and DVR that I need to know about? Ever Feel Overwhelmed by “Simple” Tasks? Try Using Scripts! Do you ever feel overwhelmed by a “simple” task? Or find yourself forgetting pieces of something that you “should” be able to remember by now? It might be getting through that stack of papers, preparing for a camping trip, or just getting everyone out the door in the morning. But whatever they are, most of us have tasks that sometimes feel overwhelming and things we forget along the way. One day I realized there must be a better way. I noticed that there were certain tasks or projects I performed only once every so often, and that when I had to do them, I was always reinventing the wheel. I’d make a to do list from scratch and fret over whether I’d remembered everything. And then, after being too wound up by the whole thing, I’d inevitably forget something obvious. But it occurred to me that I could write myself a “script”, put it in a place where I’d know to find it, and use it. Now, rather than over-thinking things and being constantly worried I’ve forgotten something, I just work through my script. My past-experienced-self coaxes me along reminding me exactly what needs to be done, based on what I learned in the past. If you’ve never tried something like this, or don’t already have your own version of it in play, consider giving it a try. You can always adjust it to meet your particular needs and personality. So off we go with scripts. First I’ll explain what a script is and what you can use them for, then I’ll give you examples of how I like to use them, and then I’ll get you started on making your own. You can skip around, of course, but if you’ve never encountered something like this before, you might want to give yourself a few minutes to read through the whole thing when you aren’t in a hurry. Is Your To Do List Depressing You? I’ve got that love/hate thing with my to do list. I love the list. It lets me feel organized (even if I’m not). The undone staring me in the face? Mmmm… not so much. Historically I’ve sabotaged my productivity by the way I create and use my list. I put so many things on there that managing the list itself requires an embarrassing amount of time. I put things on it that there is no way won’t get done. Like “cook dinner”. What, am I going to forget? I might need to set a timer to remind me that it’s time to get started, but I’m not going to forget. Or things like “hang curtains”. Really? I notice the curtains every cussing day. I don’t hang them because a) I need the dude’s help and b) drilling in cement makes the sort of mess I never want to clean up. The truth is, I don’t “forget” to hang the curtains. I see them every day. I just choose not to bother with it. Which means it’s a ridiculous use of my to do list space. Then a few years ago I read David Allen’s Getting Things Done and discovered soooo many other ways my to do list was messed up. Like the whole “actionable” thing. Allen points out that so often we put things on our lists that aren’t actionable. Things like “Dude’s birthday party”, or “car maintenance” or “garden”. Those things are categories. But what is it that needs to be done exactly? As he explained why such practices are a problem and what to do instead, the lightbulbs started going off. I was a major transgressor. How did these things never occur to me before? my “to do” was a list of perfection-achieving tasks. It had stuff on it – lots of stuff – that didn’t really need to be done. Things like “get a lamp for the living room table.” When, really, if we move out of this house and there’s no lamp, it won’t matter a bit. Except that we’ll have less to move. Or something like “organize the office supplies.” I realize many people may actually need to organize their office supplies so they can find things or for their sanity. But we don’t. Ours are orderly, and we can find what we’re looking for. It’s not perfect, but it’s functional. And it’s not bothering anyone. And taking something that isn’t bothering anyone from “functional” to “perfect” is not necessary. I don’t need help remembering that, thanks. The only thing having those items on my to do list accomplished was to remind me of all the ideas I have that I haven’t acted on. And I have lots of ideas. Of course, when things ARE acted on I delete them from the list. How depressing! To only be reminded of the things you’ve never acted on when there are so many things you have! And good riddance! With all that junk removed, it’s so much easier to focus on things that will make an impact on my life now, rather than getting distracted by the superfluous. And it’s so much less depressing! What about you? Is your to do list flawed? The other day my friend Jenny sent out a call for help on Facebook. She needed to reorganize her kitchen and didn’t know where to start. Perhaps you can relate. And even though I can’t rush over and help her (or you) in the flesh, perhaps I can still help by sharing this technique. I’ve read a lot about organizing over the years. I’m cluttery and messy and, in the past, have had a relatively high tolerance for a certain amount of uncleanliness. But I’ve always liked things to be organized. I like being able to find something when I need it and I like orderly appearances inside my cupboards and closets. Nearly every single book or article I’ve read on the subject promotes some variation of what I’m calling “The ABC Principle” for functional organization. I’ve used it in many, many spaces over the years and promise you that it works works WORKS. You don’t need special containers or label makers or anything new. This is a principle. How you put the principle into practice is entirely up to you. 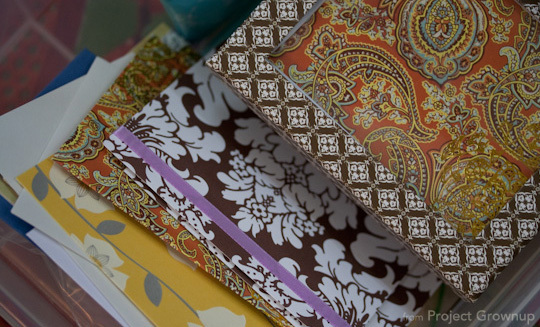 If you are an organizing genius, you can go ahead and stop reading now. There is likely nothing new here for you. Instead, please help the rest of us out by sharing your smarts in the comment section below. If, however, you have some spaces that aren’t working for you and don’t know where to begin. Read on, dear friends, read on. The gist of the ABC Principle is to put the most regularly used items in the most accessible spaces. Likewise, rarely accessed items go in the most inaccessible places. The ABC principle provides structure for thinking about your stuff. I’m calling it “The ABC Principle”, because the idea is to categorize your available locations as A, B, and C; then categorize your items as A, B, and C; and then put like letters together. And also because I don’t know what else to call it. A – These locations are the very easiest to get to. They are at an arm’s reach from normal postures (standing at the sink, stove, or fridge in a kitchen; or sitting at a desk in an office). You should be able to reach them without straining or crouching or digging. “A” locations are golden real estate. B – These locations are still relatively easy to get to, but not as ideal as “A” spaces. You might have to bend, reach, or dig a little, but no stools or gymnastics are required. C – These locations are the most challenging to get to. Places like small cabinets over the fridge or top shelves or the garage. C – Stuff you use nearly every month. Got it? Great. On we go. You can put this principle into practice any way you wish. But I don’t want to leave you stranded without a place to start, so I’m going to show you how I do it. If it suits you, use it. If not, leave it. My kitchen is cuckoo. If you were to look really closely at my diagrams that follow – which I don’t recommend – it would not make any sense. This is because my kitchen doesn’t make any sense. It has two near-unusable cabinet spaces, three small drawers, and two large elevated concrete slabs. Ikea and I have become good friends. Anyway, here we go. I’m going to walk you through the steps I use, give you a few notes on the process, and then summarize the whole thing into it’s simplest parts. The goal here is to gain a clear understanding of my space; to know what spaces are most usable, what spaces are most difficult, and to understand how I access the places I have available for things. 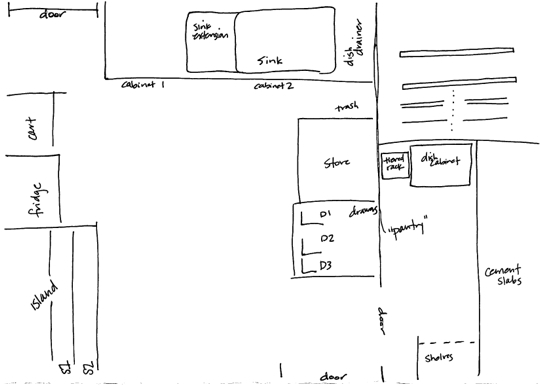 I draw a rough sketch of the space I’m organizing, be it the kitchen, a closet, the home office, whatever. The sketch is basic blueprint of the space, but with indicators of shelves and drawers and such. Nothing Fancy. It just helps me see what I’m working with. I like to do this part in pencil or black ink.